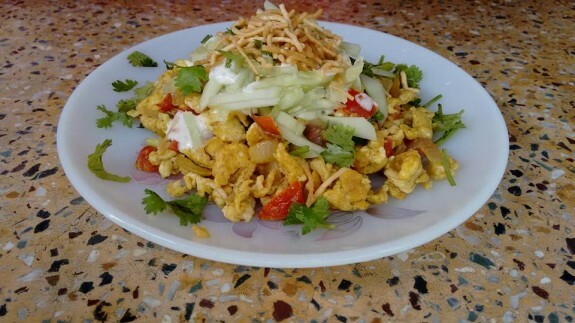 Egg bhurji is one of the popular dishes in India mainly in northern and western part. Here I present the same egg bhurji as a chaat in a twisting way so that everyone can have this as yummy and tasty snacks. 1. Take a bowl and beat the 3 eggs properly. Add little salt and mix well. 2. Now heat oil in a pan and add onions. Saute it for 1-2 mins until onions become light brown. 3. Add chopped tomatoes and green chillies and saute for another 1-2 mins till tomatoes become soft. 4. Now add the beaten eggs and continuously stir it to make the bhurji. Add turmeric powder, chaat masala powder or lemon juice, red chilli powder and mix well. Cook everything for 2-3 mins. Continuously stir it. You can add little more salt if needed. Add chopped coriander leaves and mix well. Now swtch of the gas oven. 5. Take a small bowl and whisk the curd properly. If you want you can add little spice masalas here also. 6. Serve the egg bhurji and top with half amount of curd mixture. Now on top add chopped cucumber and again give the toppings of mint chutney, tomato chutney and curd. 7. Garnish with bhujia (Haldiram) and chopped coriander leaves. 8. While eat, mix everything and then have it.